Across the world, the housing crisis is escalating. Mass migration to cities has led to rapid urbanisation on an unprecedented scale, while the withdrawal of public funding from social housing provision in Western countries, and widening income inequality, have further compounded the situation. In prosperous US and European cities, middle- and low-income residents are being pushed out of housing markets increasingly dominated by luxury investors. The average London tenant, for example, now pays an unaffordable 49 per cent of his or her pre-tax income in rent. Parts of the developing world and areas of forced migration are experiencing insufficient affordable housing stock coupled with rapidly shifting ways of life. In response to this context, forward-thinking architects are taking the lead with a collaborative approach. By partnering with allied fields, working with residents, developing new forms of housing, and leveraging new funding systems and policies, they are providing strategic leadership for what many consider to be our cities’ most pressing crisis. 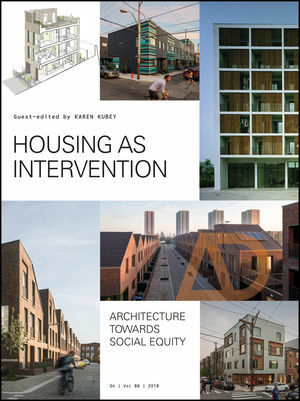 Amidst growing economic and health disparities, this issue of AD asks how housing projects, and the design processes behind them, might be interventions towards greater social equity, and how collaborative work in housing might reposition the architectural profession at large. Recommended by Fast Company as one of the best reads of 2018 and included in their list of 9 books designers should read in 2019! Karen Kubey is a New York-based architectural curator, editor, designer, and educator specialising in housing design and research. She has edited and contributed to over a dozen publications. As the first executive director of the Institute for Public Architecture, Karen helped build a public interest design nonprofit with a national presence. Trained as an architect at the University of California, Berkeley, and Columbia University, Karen began her career in affordable housing design. She co-founded both the Architecture for Humanity New York chapter and New Housing New York, the city's first design competition for sustainable and affordable housing. Currently a visiting associate professor at Pratt Institute, she has taught housing studios at Parsons The New School for Design and the New Jersey Institute of Technology.